It's a bright, sunny Sunday here in Mauritius - perfect weather to hit the beach, as my snorkeling-crazy lads are hinting not so conspicuously. :) I love bright days, but I don't really like being out in the sun... so sitting down in my living room bathed by sunlight to catch up on all those amazing Six Sunday Sentence excerpts sounds like my kind of plan for a perfect end of the weekend. Thanks to everyone who comes by every week to read my snippets from Walking The Edge. Your words mean so much - you have no idea. Reading all your comments is a highlight of my week. "... It can't be. She was the same woman who'd met him at the bistro, yet, at the same time, she wasn't - her features were different, harder, and, he realized with dread, completely focused yet expressionless. Something told him to take another look. She hadn't dropped the gun, and for an insane moment, he wondered if she'd aim it his way and shoot. There had been no hesitation in her two shots, and, as his eyes took in the way she held the Sig—one hand curled around the grip and the other anchoring it—a realization clattered in his brain. She held it like a professional and merde if she hadn't shot like a professional too. ..."
Wonderful six! Great work lovely Lady. So you're posting this week? Will drive by soon. Hugs! First, what a lucky lady to be living and writing where you are! It must bring you incredible inspiration. Love your six! Sounds like a great read. Nice job. Thank you Sandra! Yes, Mauritius is a lovely, beautiful place. Paradise on earth :) and I can't conceive of living elsewhere. Loved your 6...great internal musings showing his conflict about his feelings for her. Can't wait to see what you post next week! Intriguing lady! 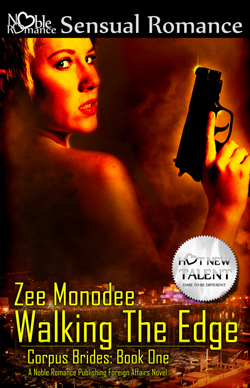 Great details about how she holds the gun to demonstrate her proficiency in it. Not much sexier than a woman who knows how to use a gun. lol! Great six!! I couldn't wait to get back here this week. Your story has stuck with me. It is definitely on my TBASAP (to buy as soon as possible) pile. Great six! Mauritius! Color me impressed and jealous. I'm with you about the sun though. On to the six. I adore a strong woman capable of surprising with her abilities. Nice! Oh, love this - two sides of the same woman. Definitely has his attention now, lol. Great work! Love a woman who can handle herself! Awesome six! Yep she sounds thoroughly professional. Now, what's he gonna do about that? Great six! I think he's in big trouble! Your characters are developing nicely. Well done. Great six, makes me want to know more about her! Super suspenseful and well-written. It's great to follow along with his deductions as he makes them! Excellent six! Love a "professional" woman. *BG* Great six! I wonder how she got there in time to save him? And just who is she? intriguing 6. She met Gerard at a bistro in town, and they had a rather violent encounter in the alley next to the eatery. He thought he left her weakened and scared, but she picked herself up and has been following him all the way (you can catch previous SSS snips where the fight in the alley was shown). LOVE IT, as always! Zee...YOU ROCK! ARGH!! I want more right now!!! Ze plot thickens!!! I have to see more!!!! Thanks though, and congrats again on your amazing req!